This billboard is by pop artist Peter Tunney, who added the extra “T” as an expression of, he says, turbo-charged gratitude. Here in America, it is the week of Thanksgiving! This time is otherwise known as the countdown to Christmas. Or the beginning of the end of the year. Or the week of insanely indulgent eating in the name of gratitude. (Har-Dee-Har-Har!) But when you genuinely peel it apart, the word Thanksgiving breaks down into two words -- Giving and Thanks. Many of us live full-time lives of gratitude. We don’t wait for a particular Thursday of the year to come around to remind us to give thanks. Counting blessings and telling people we are grateful for them is a daily occurrence. ‘Thank you’ is one of my favorite word combinations. Personally, I believe that even non-living things hold energy, and everything needs to feel loved and appreciated. I have a practice of thanking nearly everything. I mean every THING. I speak to these things as if I were speaking to a dear loved one. I say things like "Thank you oven for being an oven," "Thank you water for coming out of the faucet," "Thank you feet for carrying my body every day". " Thank you bed, for being my bed"... Even this morning I was prepping for a big brunch for a client and I thanked my bacon for not burning. It seems extreme and perhaps ridiculous, I’m sure. But more than a practice of gratitude, it is a practice of not taking things for granted. A practice of appreciating. And loving. Give someone your seat on the subway. Give a ride or a swipe on your metro card. Give someone your parking spot. Give a round of applause. Give someone the last bite. Give up your place in line. Give to a charity by volunteering. Give heaping helpings of seconds and thirds of love. May love be the biggest serving on your plate during your Thanksgiving feast! What am I missing? Give me some more “gives” in the comments below. I made one of my favorite salads for a dinner party this week. To quote an old friend, "It's easy fancy!" I’m giving you the recipe and thanking you for supporting me every week as you open up, read, share, and comment on All Good Things! For dressing: Whisk all ingredients in a small bowl to blend. Season dressing to taste with salt and pepper. For pears and salad: Preheat oven to 400°F. Scatter thyme sprigs on rimmed baking sheet. Place pear halves, cut side down, on work surface. Starting 1/2 inch from stem and leaving pear half intact, cut each lengthwise into scant 1/3- to 1/2-inch-wide slices. Press pear gently to fan slices; place atop thyme sprigs. Drizzle pears with honey; sprinkle with salt and pepper. 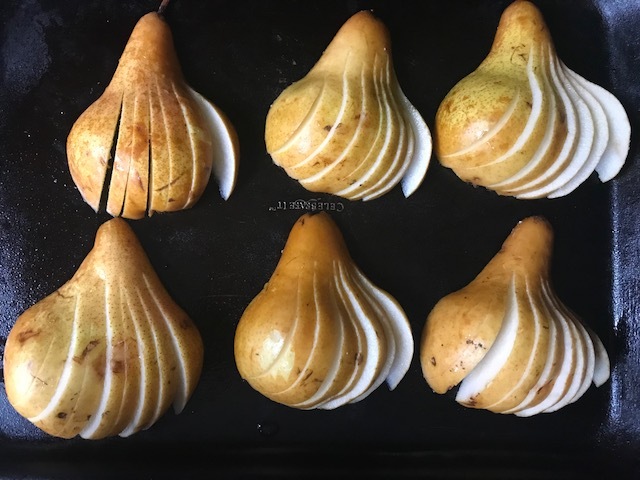 Bake until pears are tender, about 15 minutes. Let stand on baking sheet at least 30 minutes and up to 3 hours. Place salad greens in a large bowl. Add just enough dressing to coat the greens. Divide salad among plates. Place pear halves on top of greens. Garnish salads with cheese and sprinkle with nuts. Drizzle with a little more dressing.